It has been called the “Domesday book of British wildlife” – Silent Summer, compiled by 40 of Britain’s leading scientists, provides a complete picture of the state of the Britain and Ireland’s wildlife. I asked editor Norman Maclean about his favorite animals and finds in the UK, US and around the world. What wildlife animals were most absent from the audit? Any surprises? Which ones have made major gains/losses over the years? The declines in Common Seals in the UK are very surprising, given the dramatic increases in their cousins the Grey Seals. Also our recent UK declines in House Sparrows and Starlings have been substantial and the causes hard to identify. You’re based in the UK and the study highlights the British Isles. How much travel have you done in North America and what sort of trends have you seen in your travel and research? Yes I have traveled quite a lot in the US, Canada, and Latin America, and spent a year working at the Rockefeller University in Manhattan. I recall being on vacation a few years ago at Buck`s Lake in northeastern California and finding numerous different species of woodpecker all exploiting slightly different niches in the same woodland. In the UK we have only three woodpecker species, and one, the Lesser-spotted Woodpecker, has recently declined rapidly and is now quite rare. This could be a result of the recent increase in the numbers of our Great-spotted Woodpecker, which predates the Lesser-spotted. I recall very much enjoying seeing seven different Woodpecker species at their nest holes in Poland in early May. I also love finding the many different species of American salamander as the UK has only three. My favorite US wildlife location is the Saquaro desert in Arizona. It is just astonishing, with every species showing wonderful adaptation to desert life. However, I have never seen a rattlesnake although I have often looked for them. Better luck next time. Do you believe people are more concerned today with protecting our natural places and wildlife today or, say, in the late 60s/early 70s when it started? Any differences between the US and British Isles in terms of attitudes or legislation? 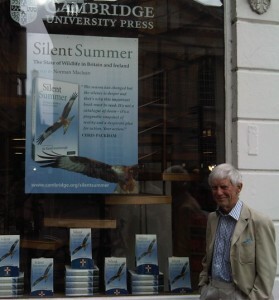 Norman Maclean outside the Cambridge bookstore in the UK. Yes undoubtedly people are much more concerned about wildlife conservation now than in the 60s and 70s. The striking difference between US and UK in terms of wildlife is just how much wilderness you have left. We, by comparison, are a tiny island and the human imprint on our land and sea over the last 3000 years is very strong. There is little true wilderness left. I love birdwtching in the US, partly because you have so many so many species of birds such as warblers and woodpeckers. But I also find American birders very friendly and keen to help me find the species that I am looking for. I recall watching the Autumn migration of birds and insects at Cape May in New Jersey. The dawn movement of birds was incredibly exciting, as was the Southern movement of Monarch butterflies and dragonflies. I saw in an article you’re going to Ethiopia as well. Have you traveled to lots of continents and countries and noticed changes in attitudes or protection over time? I have observed wildlife in more than 50 countries worldwide. Yes, there is much more concern now about wildlife and conservation, but in terms of tropical rainforest it seems like too little too late. I was in Borneo recently looking at Orangutangs and Proboscis monkeys. They survive in tiny pockets of remaining rain forest surrounded by endless acres of oil palm plantation. Insects, birds, mammals… what is your favorite fauna? Favorite fauna? I don’t really have one. I like wandering through unspoiled country savoring the whole ecosystem biodiversity. Some years ago I was living for a short time in a field station in the jungles of Brunei. We had a generator which provided electric light for two hours each evening and the insects that flew in out of the jungle to my lighted verandah were just amazing. So, there are still good places left. Norman Maclean is Emeritus Professor of Genetics at Southampton University with a strong hobby interest in wildlife, conservation, river management re trout fishing. He has observed wildlife in more than fifty countries around the world and is the author and co-author of about 150 scientific papers in learned journals.